My time in Arizona is coming to a close, but I want to visit one more area before heading to New Mexico. It’s not easy to leave Indian Breadrocks; it’s been a deeply restful time deep in nature with a dear friend who loves nature as much as I do. There has been very little distraction from the outside world. Which I have come to think of as my other world. This is becoming my outside world. We haven’t bought groceries in two weeks and I have fun creatively combining the random ingredients we each have in our respective pantries. Today, we discovered everything needed to make a big pot of chicken vegetable soup, using bone broth, a can of chicken, carrots and potatoes. Note to self: When building your cabin this summer, make sure you add an outdoor kitchen! 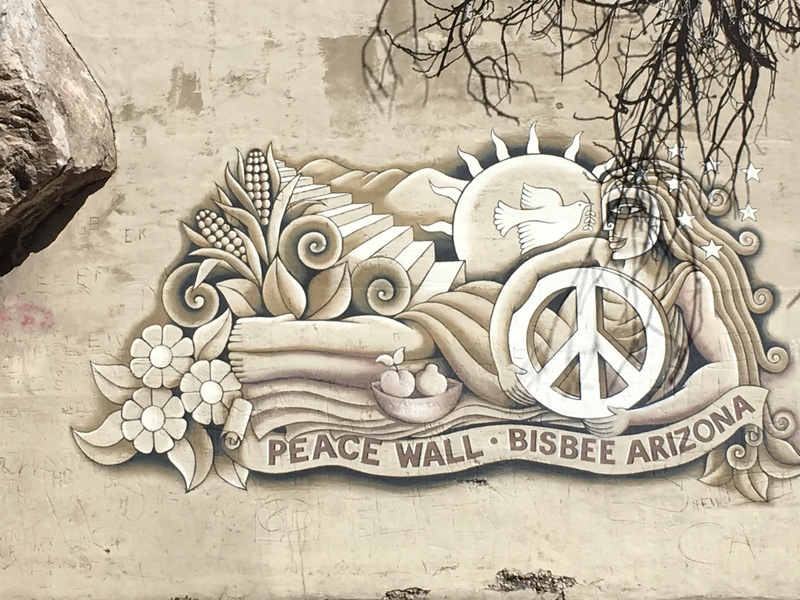 We decide to spend our last two days travelling together in the Bisbee area, where neither of us have visited. We pack up camp (a little reluctantly) and are on the road by mid-morning. 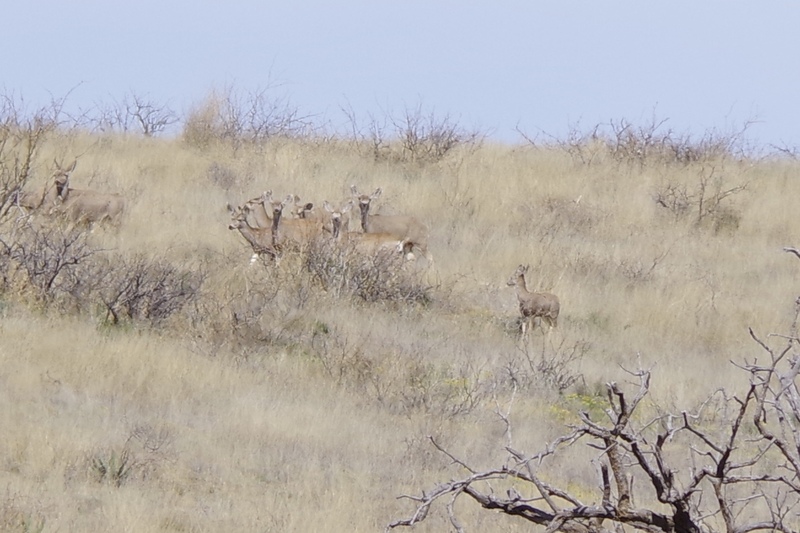 We say a fond farewell to one of our many neighbours, and on route see a herd of mule deer. The terrain changes; and we find ourselves in grasslands. We stop at Whitewater Draw Wildlife area on route, and although we don’t feel compelled to camp here, we enjoy walking the trails and enjoying many birds that migrate here. Most of the cranes have left, but we catch a small flock squawk-landing. The highlight for me, was being treated to seeing a pair of Great Horned Owls, who have nested in the large shelter there. Truly, it’s more than a treat. It’s an honour. Mama Owl, in her nest in the tall outbuilding at Whitewater Draw. I have deep respect for her “dont mess with Mama” eyes! We think this is Papa Owl, in a nearby tree. We arrive in Bisbee and it is much busier than I was prepared for. Truth is, I don’t really prepare when I travel, preferring to just let things unfold without too much planning. I never really know where I’m going to land or what to expect, LOL. What I got was a beautiful Saturday afternoon in this popular destination town, with many other visitors there to see the sights. We parked a bit outside of town and enjoy a couple hours walking the historic streets, popping in and out of stores and enjoying the “feel” of the place. Although it is lovely, I’m “full” after a couple hours, and anxious to get back to a more rural setting. 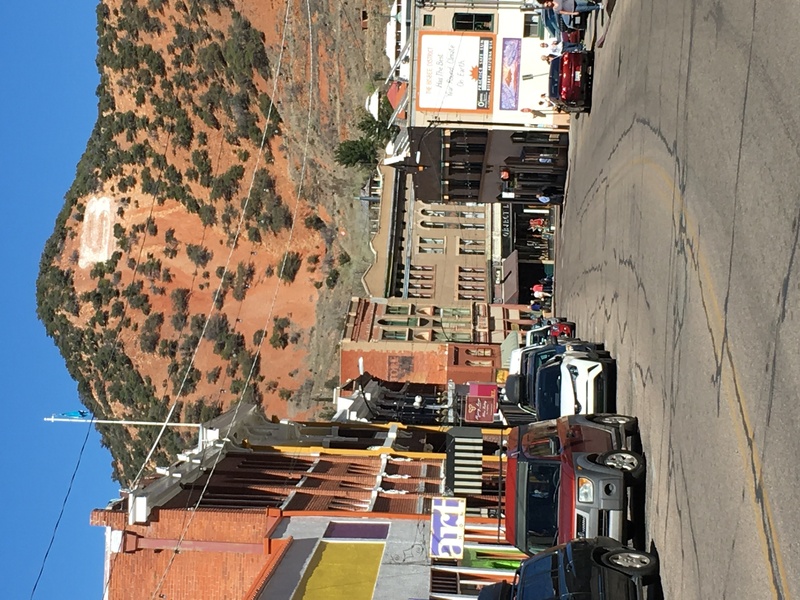 Bisbee is the kind of town I used to be able to spend hours wandering through, but I’ve noticed a waning interest in commerce. Even window shopping is losing some of it’s previous appeal. I enjoy it, but I don’t feel pulled. I’m conscious that I’m skimming, not sinking. But as far as a skim goes, it was very pleasant. In late afternoon we make our way to the San Pedro Riparian Conservation House; known for it’s excellent birding along the San Pedro River. We thought we could camp, but on arrival learn the gate closes at dusk. Neither of us feel concerned about finding a night roost, so we take a long walk as the sun begins to set. One of the things that changes after you’ve been on the road a while is that urgency around finding camping. 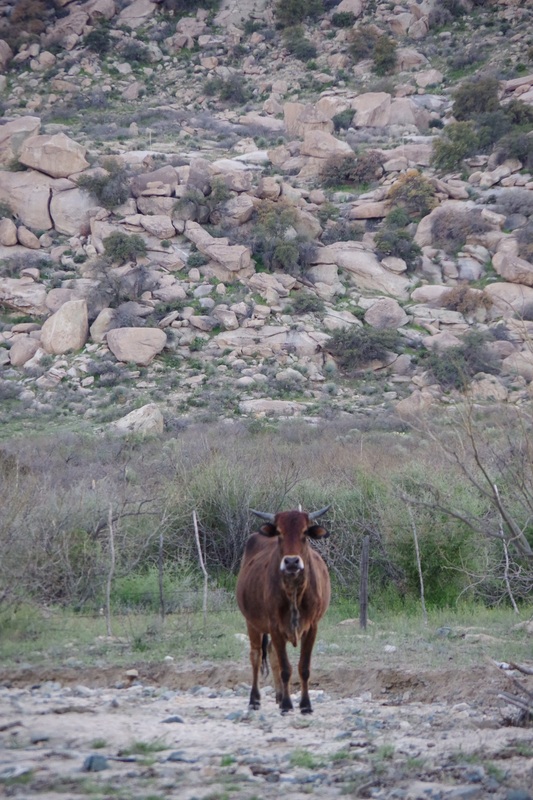 We’re in rural Arizona, and are surrounded by National Forest and wildlife areas. We know we will find something. During our walk, I see my first vermillion flycatcher ever. I thought I was hallucinating! It’s the most brilliant red bird I have ever seen. Walking into the riverbed area feels like walking into a cathedral of trees, and we whisper out of respect. I wonder if other people do this. Whisper when they enter into certain natural places. I have a deep and newfound respect for trees in the desert. For all they provide. Reaching our vans, we take a look at a paper map and make our best educated guess about where we might find home for the night, and within twenty minutes find a very quiet trailhead parking lot where we won’t disturb anyone. In this outside world, I feel welcomed with open arms. This year was my inaugural Snow Bird trip to AZ from southern Alberta. Your trip to Whitewater Draw (Cranes are there until February) and Bisbee reminded me of great times there too. If you get the chance (and have not yet done so) check out the Chiricahua Nat’l Monument and hike down the Echo Canyon to the visitor centre… walking thru the Rhyolite Rock formations (similar to Bryce Canyon) truly leave you with a spiritual sense. I so enjoyed reading your commentary and looking at your pictures. It makes me want to leave my house this minute and get out there again. Still have my house and I’ve been sick recently so I’m kind of glad I’m not on the road right now actually. I met you at women’s RTR. I love the pics of the owls too. So awesome! I’m not planning on going full time but I do want to do extended trips in the RV. Still have loose ends to tie up at home and business before doing any extended trips. Thanks for sharing. I just love your tales from the road but even more so your pictures. Thank you for letting me see the beauty around you. :). Thank you for sharing in your travels, photos and insights as to what has meaning and what doesn’t. 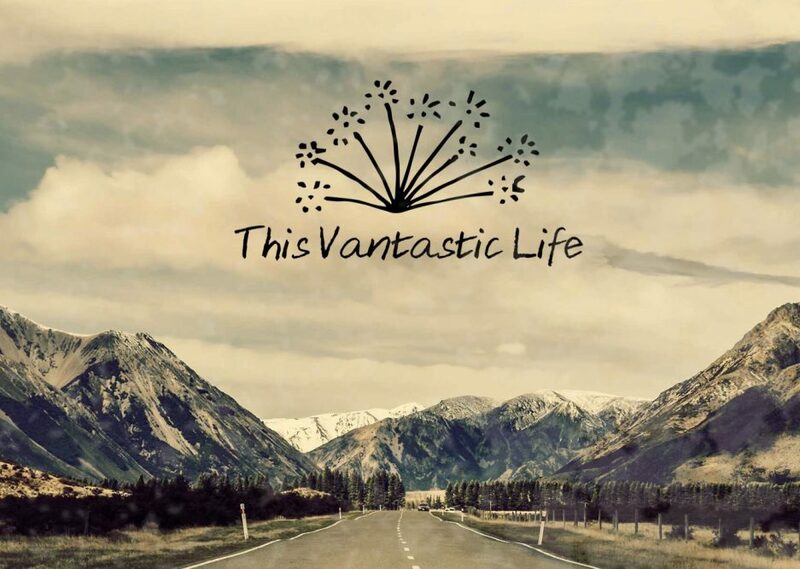 You continue to inspire a soon to be novice van traveler. Finding authenticity on what really matters enriching. Isn’t it wonderful when we know it’s not about “stuff” but staying centered and being in the moment, priceless. So many of your photos state this as well, especially that terrific pot of soup. Kudos to you and your friend. Continue being safe and blessed.